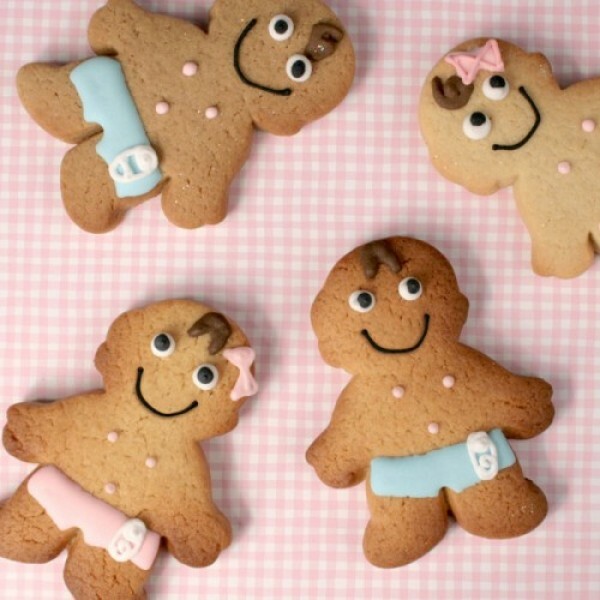 Whether you’re looking for a cute way to announce your pregnancy, reveal your baby’s gender, or celebrate the birth of your little one, these adorable baby cookies are the perfect gift. Available in pink, blue or lemon, they’re also ideal for baby showers and congratulations gifts. Individually wrapped cookies are made in your choice of flavour or flavours. a) Chocolate Brownie - cakey texture, rich chocolately taste. b) Real vanilla (made with Bourbon Vanilla Extract) - semi soft with the flavour of natural Vanilla c) Ginger - soft & cakey with a ginger kick. Cookies Contain: Wheat Flour, Sugar, Butter (Milk), Golden Syrup, Palm & Rapeseed Oils, Cocoa Powder, Whole Egg, Vanilla Extract, Ground Ginger & Ground Cinnamon; Salt, Dried Egg White, Maize Starch, Glycerine, Glucose Syrup and some of the following Colours E102, E104, E122, E124, E129, E133, E155 & E151* *Colours present vary depending on design and type of icing used. The food colours that we use are dissolved in 'carriers' which may be present in trace quantities. These carriers comprise Alcohol, Glycerol, Propylene Glycol, Silicon Dioxide, Stabilisers (Carboxymethyl Cellulose, Guar Gum) Emulsifier (Polysorbate 80) and Citric Acid. Cookies contain allergens Wheat (Gluten), Milk and Egg. Cookies are made in a bakery where Nuts and Soya are also handled.